For the next few months AIATSIS will exhibit Singing The Train. The exhibition tells through an Aboriginal song sung in Njamal language, of the first railway that ran between Port Hedland and Marble Bar in the Pilbara between1910 to 1951. The song was created by Aboriginal composer and stockman Larry Brown and passed to his daughter Topsy Fazeldean Brown who performed it in 1964 at Port Hedland. Larry Brown composed Singing the Train using traditional Aboriginal song styles which expressed his feelings of this new addition of a train line to his Country. Singing The Train is a collaboration between Wangka Maya Pilbara Aboriginal Language Centre, Revolutions Transport Museum and AIATSIS. For more information on Singing The Train, you can visit the website here. An event to celebrate the launch of Partulyayimarta: Ngarla Birds will take place on Monday 28 November at Wangka Maya’s South Hedland office from 10.30am to 1.00pm. Partulyayimarta: Ngarla Birds documents an Aboriginal way of identifying, naming, and classifying birds. 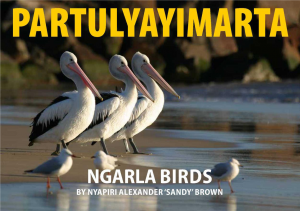 It also provides additional cultural and linguistic information alongside scientific and common English names for 117 different birds found throughout traditional Ngarla Country. For more information about the event, you can contact Wangka Maya at 9172 2344 or Larissa Brown at 0488 773 143. RSVP’s are welcomed until Thursday 24 November. The book is $40, and it is available for purchase at the event and on the Wangka Maya website here. The theme and poster competition for NAIDOC Week 2017 have been announced. The theme will be ‘Our Languages Matter’ and will seek to celebrate the essential role Aboriginal languages have in cultural identity and linking people to their Country. You can learn more about he theme here. The 2017 NAIDOC Week poster competition has also begun. You can find more information about the competition here, and download the entry form here.